« Our mass delusion of American prosperity and national well-being is killing U.S.
Trump is merely extrapolating from Bush’s policies, and keeping his voter base happy. Donald Trump wins no awards for decorum or propriety. He is undoubtedly odious, temperamental and has an incredibly fragile ego as evinced from his continued Twitter spats. In no way do I endorse Trump as a good president, because he has bullied, intimidated and lied his way towards winning the most coveted and powerful seat in the world. However, despite it all, I still think he is the best president for the Muslim world. Why? Because he has singlehandedly jolted Muslims from a stupor that has plagued our countries for long. We have played the victim card to America’s ills for far too long, without even glancing at the self-made problems which exist closer to home. Consider George W Bush, who was a far more menacing threat to Muslims than Trump. He carried out not one but two wars against Muslim countries, with one of the wars being conducted entirely under false pretences. When Trump declared his infamous Muslim ban as part of his election manifesto, Muslims throughout the world were in uproar about it, purely because it was seen as Islamophobic, xenophobic and quite pointless in the fight against terrorism. However, in December 2017, Christian worshippers were torn to shreds by a suicide bomber in Quetta simply for believing in a different religion. Where was the outrage then? This is not even the first incident to occur against Christians living in Muslim lands. There have been numerous bombings at churches where Christianity and Islam coincide, namely against Coptic Christians living in Egypt. Critics could argue that similar ‘bombings’ have happened in Muslim mosques in western countries, but those have been instigated by disgruntled individuals on a much smaller scale, and punishment is always meted out to the perpetrator. Similarly, when Trump blamed mental health as the cause of gun crime in America, critics stated that his eerie silence against “white” terrorism was hypocritical. However, Ahmadis, Shias, Hindus and Christians are killed on a daily basis throughout the Muslim world and no one bats an eyelid or causes such uproar. What about Mashal Khan? A Muslim man who was killed by his fellow Muslims because of alleged and unproven ‘blasphemy’? Poverty or illiteracy cannot be blamed for his horrific death, because those who murdered Mashal were university students. Will his death, or Salman Taseer’s, make any difference in our psyche? Will we recognise Ahmadis as human beings worthy of kindness and acceptance? Recently, Trump made the incredibly incendiary decision to declare Jerusalem as the Israeli capital, thereby undoing years of supposedly neutral American foreign policy with regards to the Middle Eastern conflict. This was, unsurprisingly, met with much resistance both from Palestinians and the United Nations General Assembly. However, the Muslim world has been shockingly quiet about the on-going war Saudi Arabia has been waging in Yemen. While Yemen is on the brink of collapse and emaciated children are being denied the basics of life, Mohammad bin Salman is adamant that Houthi rebels must be taught a lesson. 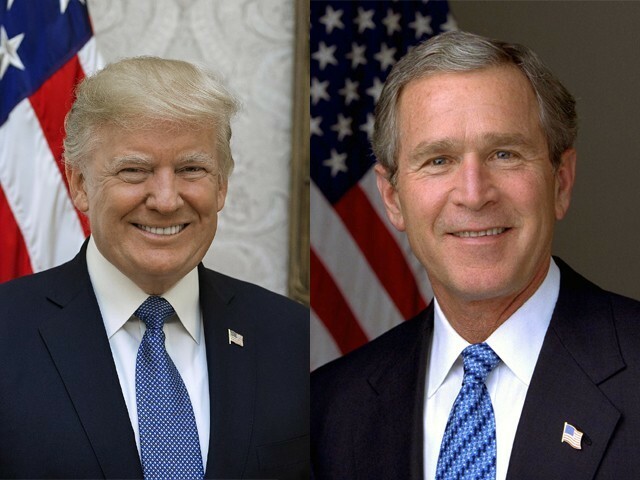 Trump has also signed an executive order to not shut down Guantanamo Bay, which is a detention camp for suspected terrorists that Bush opened during his tenure. It has been a highly contentious issue amongst human rights organisations, who argue that inhumane treatment is meted out to the individuals who reside therein. Obama promised to close down the detention centre, but wholly failed to do so. Trump is merely extrapolating from Bush’s policies, and keeping his voter base happy. If Bush hadn’t instigated the building of this camp, it would never need to be extended by Trump today. This entry was posted on Monday, August 20th, 2018 at 00:05	and is filed under Uncategorized. You can follow any responses to this entry through the RSS 2.0 feed. Both comments and pings are currently closed.